Slavery in Mamaroneck Township is a project that aims to document what is known about local slavery, slaves and slaveholders from the early 1600s, when slavery was introduced to the area, to 1827, when the evil practice was finally abolished. As additional information is uncovered, more material will be posted here. All of the articles were researched and authored by Ned Benton, a professor at John Jay College of Criminal Justice and co-director of the New York Slavery Records Index. Many were published first in The Larchmont Gazette, starting in 2005. Others were published first with The Larchmont Historical Society. The project owes a debt of gratitude to Judith Doolin Spikes, whose books, frequently referenced within the site, are essential to understanding who the slaveholders were and where they lived. The site includes Documentation, which lists bibliographic and census information used to research the five slavery articles by Ned Benton that are listed in the menu at left. Demographic information appears in the List of all known slaveholders and slaves. 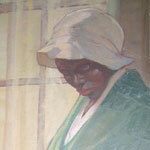 Small Family Memories recounts anecdotes from the life of one slaveholding family member.